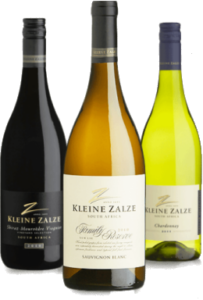 When Anthony Van Schalkwyk of Kleine Zalze visited the UK recently to present a tasting billed as “Past Present and Future,” I was surprised to learn that the company claims to be the number one, best-selling New World wine brand in the UK on-trade (bars, restaurants, hotels, etc.). The wines were pretty well-known to me, and I had stayed on the Kleine Zalze estate on a previous visit to South Africa’s Cape, but that is quite an achievement for this clearly ambitious brand. 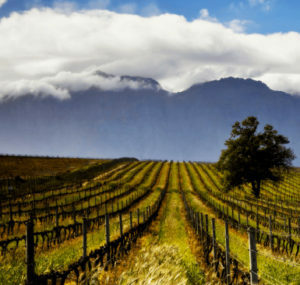 After 20 years this ambitious company is clearly going strong under the leadership of Kobus Basson, and they are managing that sometimes difficult balance of having high quality wines, but with mass-market appeal. Though their position as #1 on-trade brand from the New World is an enviable one, the current weakness of the Rand also brings challenges in commercial terms: “The Rand is so weak that 15% of South African producers are estimated to be making a loss on every bottle sold,” says Anthony with a resigned shrug. So the hard work to keep building this brand will undoubtedly go on. (2016) Fine zesty and elderflower nose, but the ripe topicality of the fruit comes through beautifully. On the palate that green bean punch of flavour and oiliness, but really lovely acidity to cut the fruit and texture, broadening to a hint of creaminess. (2016) A little bit of tanky, pear drop character, then honey and fat lemony fruit comes through, more luscious notes too. The palate is riven with orange and citrus, but great concentration and phenolic grip - a little too much? - massive salt and lemon presence. 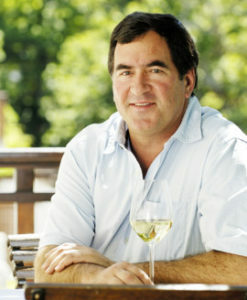 "A vintage for the record books," according to Kleine Zalze. (2016) 40-year-old bush vines from Durbanville and from Stellenbosch, matured in 2nd and 3rd fill barrels for 18 months. Quite a high, slightly volatile character, with floral notes mixing with coffee and cough sweets. The palate has a sweet berry richness, a creamy and toasty mocha layer of oak, and a balanced finish. (2016) Such solid, sweet and plummy character. A fragrant touch of incense and Sandalwood. Flooded with super sweet black fruit. Cherry skins and touches of liquorice, but really delicious balance with smooth but grippy tannins and delicious pert acidity. (2016) Lovely ripeness and richness but has more fragrant black fruit and cassis than even the Shiraz. The palate has wonderful balance between super plush and sweet fruit, and a really ripe tannin and acid structure that is concentrated but balanced and adds fine sense of freshness. (2016) Though the recipe has since changed, at this time the wine was matured in all new barrels for 18 months, with a fairly heavy toast. From the top of the home vineyard hill. Big, sweet and mulberry and mint nose, very ripe and has developed a gamy note. Sweet and ripe on the palate too, a full on onslaught of chocolate, espresso and rich, sweet black fruit. Well balanced and the tannins creamy and mellow. Massive, super ripe but delicious of its style. (2016) Toasty, creamy and truffle-scented, with a touch of toffee, this blend of Chardonnay and Pinot Noir spends 18 months on the lees and has a low dosage of 5g/l. Very crisp and apple-flavoured, lots of lemony juiciness and a nice, long finish with the gently frothy mousse. (2016) From the second-tier Zalze range, and down to £5.99 in Waitrose until 27th July 2016, this green-apple Chenin has loads of punch and just a rounding note of custard, before a crisp but sweet-fruited palate that stays focused, lively and bright to the finish. (2016) Also from the Zalze range, a little of the white wine grape Viognier does add some aromatic lift, but its the ripe, dense blueberry and damson fruitiness that drives this, just a sprinkle of white pepper and earthiness, then the palate juicy, creamy and savoury. Oak in the finish is a little charry and chippy, but good fruit and the well-judged level of tannin and acidity make it food-friendly and quaffable. (2016) 35 year old bush vines from Stellenbosch, and the wine spends six months in older barrels. Deep, ripe and settled nose with honey and apple, a touch of lanolin perhaps. Delicious palate, rippling with ripe orchard fruit and a nice salt and lemon acidity. (2016) Stellenbosch fruit aged 22 months in barrel, 30% new. Fresh, youthful, sprightly black fruit, with cassis and a touch of chocolate. This has freshness and cherry juiciness, it's fully ripe with creamy chocolate fruit, but has some tang and really cherry fresh acidity. Maybe a touch of heat just in the finish, maybe needs a year or two. (2016) Stellenbosch fruit aged 22 months in barrel, around 20% new. A wet vintage - not easy. Lovely nose, ripe and spicy black fruit, but has a touch of pepper and game complexity. Juicy and rounded, with a meat stock character but not overdone, gives a plushness and elegance at the same time. Note stockist quoted is for the 2010 vintage. (2016) From three different soils, but all in Stellenbosch, and 50-year-old bush vines. Barrel fermented and aged one year. Fresh and herb-touched nose, more zingy and fresh than the Vineyard Selection 2014. A little floral, spangle sweet note and lots of creamy quality oak and nutty apple. The oak supports beautifully, with hugely sweet fruit against sour lemon and salty acidity that is striking but delicious. A little hint of toffee. Maybe needs a little time for sweetness and acid to integrate. (2016) Coastal region fruit, from granite-derived soils high in Darling. Lots of floral and cherry lift, a little smokiness and lovely direct and juicy stuff. There's almost a lavender or violet lift and the lively freshness runs to the finish. A simple wine in some ways, but delightful elegance and balance. (2016) A blend of Stellenbosch and Coastal fruit, hrarvested late. Again a wine in a fresh, lifted style with little floral notes and elegance. The palate has a big sour plum and cherry acidity, a raft of that against a little vanilla, but again a fresh and crunchy style.